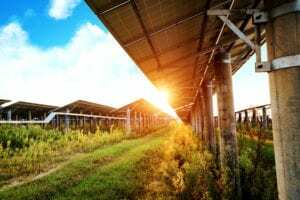 Many of these changes and trends are expanding the green and financial appeal of renewable energy. As we serve our clients daily, we hear from them that the extreme volatility of electricity prices in many markets, along with rising pressure from regulators and shareholders to promote sustainable operations, present a powerful incentive to act now. But it can be hard to figure out what options exist and which actions to take, which is why many companies still take a conventional, passive approach to energy and carbon management. So, in 2016, we launched the NEO Network™ (no “Matrix” reference intended), an online community that connects companies with resources to efficiently identify, evaluate and activate renewable energy transactions. Members of this community receive exclusive offers from developers, such as preferred pricing, and custom terms and conditions. They can also access industry experts, peers and tools to make smart energy decisions and quickly meet sustainability goals. A little more than two years later, in a blink of an eye, the NEO Network has more than 100 corporate members, a group responsible for 1.7 gigawatts of offsite renewable energy projects around the world (i.e., enough power to meet the average demand from 850,000 U.S. homes). However, we know this community has the power to do more and, you guessed it, do it even faster. Fortunately, there’s a collective fast-forward button that puts organizations in a position to find the right options with both velocity and confidence. Our aim is to provide the connections and tools required to drive sustainability initiatives. Because the need for education and reliable support has never been greater. And with every new member, the Network grows stronger. Accelerator Access will propel this community fast-forward and fast-track its impact, not only on the bottom line of individual participants, but also on the realization of a global low-carbon economy.